Jordan may be my favourite country so far. For the first few days, we spent our time touring Amman and heading down to Wadi Rum and Petra. All the nature was a welcome break from the very metropolitan atmosphere of the Emirates. It was also a once in a lifetime experience. Anyone who was with me in Namibia can attest that I’m not a fan of deserts, but I had to make an exception for Wadi Rum. After Wadi Rum, it was on to Petra, to see one of the new wonders of the world. The old city is not actually a city–but a huge collection of tombs. The Treasury that everyone goes to see is less of a bank and more of a structure that was rumoured to have stored vast amounts of treasure (this was later debunked). There’s not a whole lot I can say about Petra–it’s beautiful and if you can, you should make the trip yourself. The road into the “city” is bordered by rock walls too high for comprehension, and there’s always the risk of boulders falling or the wall collapsing. With the guidance of the lovely Rania Anwar, our tour guide for the whole trip, we gained a lot of insight into the history and background of the site. After seeing the tombs, we made the ascent to a monastery on top of a mountain, and this is where things really got cool. Students in our group pointed out the border between Israel and Jordan from the top of the mountains, which was a reminder of what we were heading toward–a conflict that has come so close to Jordan. As we got closer geographically to the land in between the Jordan and the Mediterranean, our conversations got more tense. We headed back from Petra the next day (after an early morning hike led by Peter Bartu, on which we ALMOST got lost), and that night met with the former Foreign Minister. As much as I enjoy nature, it was good to get back into the swing of meetings, and to talk about why we were here. Jordan is a safety bubble in the middle of a tumultuous region, as we heard many times. Surrounded by Iraq, Syria, Saudi Arabia, and Israel/Palestine, every major player has a vested interest in keeping Jordan stable (except for maybe Daesh–but that’s a different story). The former FM had pretty extensive knowledge of the current situations, and it was a good kickoff point. Over the next few days, we met with a UNOCHR rep doing work with Syrian refugees, Iraqi academics in exile, and an expert on Daesh. I was especially interested in the OCHR rep, because she spoke about the transition in their branch from humanitarian aid to developmental programming, because of the protracted nature of many conflicts now. One important point–almost all of the speakers we have had so far have felt very strongly that the US has a serious responsibility to work towards peace in the region, because they have done so much damage in the past decades. We haven’t necessarily gotten a good answer yet as to how that should be done, but the anger is definitely there, especially from our Iraqi friends (I wouldn’t expect anything less, given our history there). On another note, our group has a ton of great conversations about topics across the board. We disagree a lot, but I’m happy to have their company and support and challenges as we move through this trip. This has been a lot of text and not a ton of coherent thoughts, so I’ll stop here. I’m going to do a separate post for Israel and Palestine, so look out for those. As I’ve said before, I’ll be processing this trip for a long time, and these blog posts are a fraction of the feelings I have. As always, check out my Flickr here. This one has taken a little longer to put up, since after UAE we travelled to Jordan and basically went straight to the desert. But that’s for another post! Real dramatic at the top of the Burj. If you don’t know anything about the country, it’s basically a federation of seven emirates, all rules by one Emir. It’s also about 90% expats and 10% Emiratis, making for an interesting and complex society. We visited three of the emirates: Dubai, Abu Dhabi, and Sharjah, and we attended art conferences, Arab Spring panels, and had dinner with Adnan Pachachi, one of Iraq’s most distinguished diplomats. Of course, we also took a trip to the top of the world’s tallest building, the Burj Khalifa. Claudio and co goofing around on top. At the conference, a few of us met Emiratis for the first time. One of my peers, Batool, and I had a long conversation with a woman who worked with Bahouth, ORC’s policy partner in the UAE. It was refreshing to hear from a woman who was just four years out of her Master’s and was much younger than the folks we had generally heard from. We got a much better picture of UAE after speaking with her: she was passionate about the youth in the country, and about the spirit of innovation that clearly drives the emirates. There’s a lot of talk about a manufactured or artificial culture in UAE; about the “money in, money out” mentality and transitory nature of the huge number of expats. It’s hard to have hope when so many of the foreigners we met were cynical–about the future of the country, about a post-oil UAE–especially when the evidence of the economic rollercoaster is all around in the half-completed apartment buildings and compounds. But something we’re learning, and something our professors remind us to do, is how to recognize those threads of hope; to dig for them, to ask questions. The Sheikh Zayed Grand Mosque, an astounding sight. And hope we found, whether it was in conversations with intelligent young Emirati women or at the premier sustainability project of the Middle East: Masdar City. The City is both a research institution and a top-tier post-graduate and doctoral university. Its goal is to discover how to best use alternative energy, to both make the world a better place and to prepare for the day that the oil runs out or runs low. We took self-driving cars from the parking garage and were able to tour the labs and the rest of the facility, catching a glimpse of a not-so-distant future. The City is an experiment, but it’s giving the world’s brightest STEM minds a space to build a sustainable world, and I think that’s more than a good start. UAE was enjoyable, but I’ll admit that it seemed fake. Someone in our group commented that the city seemed like it was built for capital rather than people, and as much hope as I got from our meetings, I have to agree (although as I’ve said, it’s a first impression). It was almost a relief to get back to a little bit of nature in Jordan. As for the personal part of the trip, it’s certainly challenging. As much as I may disagree with some of my peers on this trip, we were all chosen because of our diversity in background and thought. It’s difficult, but it’s an incredible space to be a part of. It’s a chance to learn with students who look at each other as equals, who respect each other, even when the issues get difficult and personal (and as we get closer to Israel and Palestine, things get more complicated). But to be honest, I love it. Again, check out my Flickr for more ~artsy~ photos. I was lucky enough to be selected to go on the month-long trip with 14 other students, and I wanted to write about what I’m seeing and doing. We spend a little time in a few different countries, and our first stop was Oman. We actually started in New York, where we met with several top UN advisors focusing on the Middle East, as well as the Middle East director at Human Rights Watch. The point was to give us a little introduction to some of the issues we would see. After the city, we headed out to Oman! We only spent four full days here, but it felt like months. Our hotel was right on the water, and we packed our days meeting with the Cultural Affairs Minister, Sheikh Abdullah, the current and the former US ambassador, and a well-integrated political player (think Varys from GOT, but way nicer and way less malicious). We also got the chance to visit the Grand Mosque. The picture we got of the Omani culture, social structure, and political landscape was constantly shifting. We had been told that human rights abuses in terms of migrant workers and freedom of speech were common, but the Cultural Affairs Minister in particular painted a much rosier picture. It’s hard to know who’s telling the story with more truth–and spending only four days in a country makes it harder. Granted, Oman has been doing work to address these abuses, and has really cooperated with the requests of Human Rights Watch. More than that, their place as a player in the region is invaluable: providing a back-channel between the US and Iran, their willingness to negotiate and communicate with most countries regardless of relationship, and their overall stability is much-needed. But every country has issues, and to deny them in favour of presenting a prettier picture to the world is irresponsible. But at the center of all of this is His Majesty, Sultan Qaboos. The Sultan is revered by Omanis; since 1970 he has radically developed and improved life in the country, and his personality and achievements grant him popularity. The image that Oman projects of itself, then, is one of open-mindedness, tolerance, progression, and fairness and balance in an unstable region. But the Sultan is very sick, and the big question on the horizon is what will happen when he’s gone. This summary has been a simplification, and I’m certainly not qualified to answer that question. Oman will carry on, but we’ll see what happens. We took a little bit of a break on Friday afternoon and drove up to Jabal Akhdar (the Green Mountain). I was told not to even Google photos of the mountains before the trip, because the views were so spectacular, and I’m glad I resisted the urge. 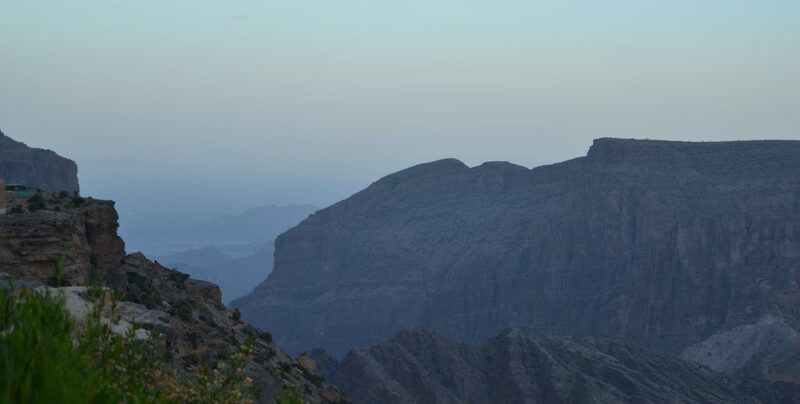 I wish I had more words to describe Jabal Akhdar, but words don’t do it justice. We took a long hike on Saturday, and it was incredible to see a little bit more of the country we’ve been studying, and to get out of the city. It was also a good last day to spend in Oman, because on Sunday morning we drove to the airport, ready for Dubai. Oman was fantastic. I’m lucky (as my peer Elijah says, “blessed, not lucky!”) to be able to learn so much and meet the number of people that I do on this trip. I’m trying to reach out, to ask questions, to challenge myself and my way of thinking. I’m having an amazing time, and since it’s only been a week, there’s a lot of learning and growing left to do. P.S. If you’d like to see more photos, check out my Flickr here.